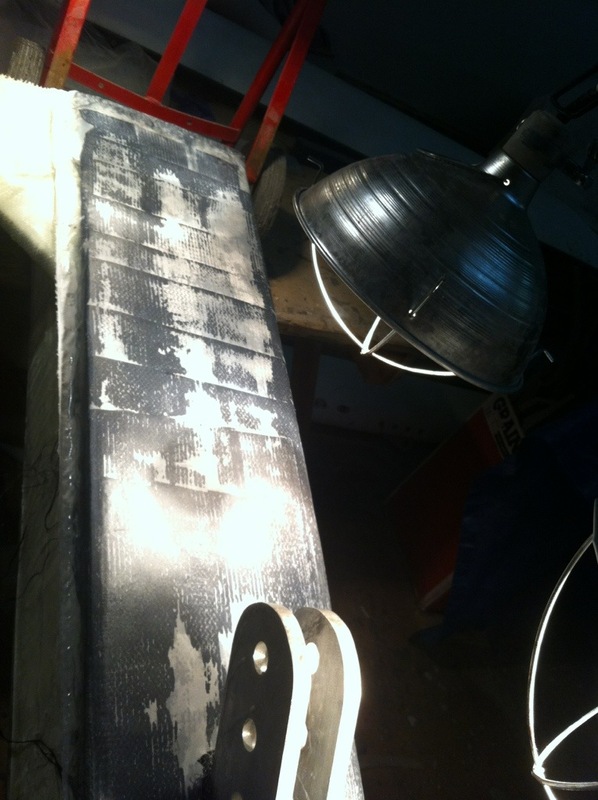 The primary beams shown in prior posts are 10″ wide. 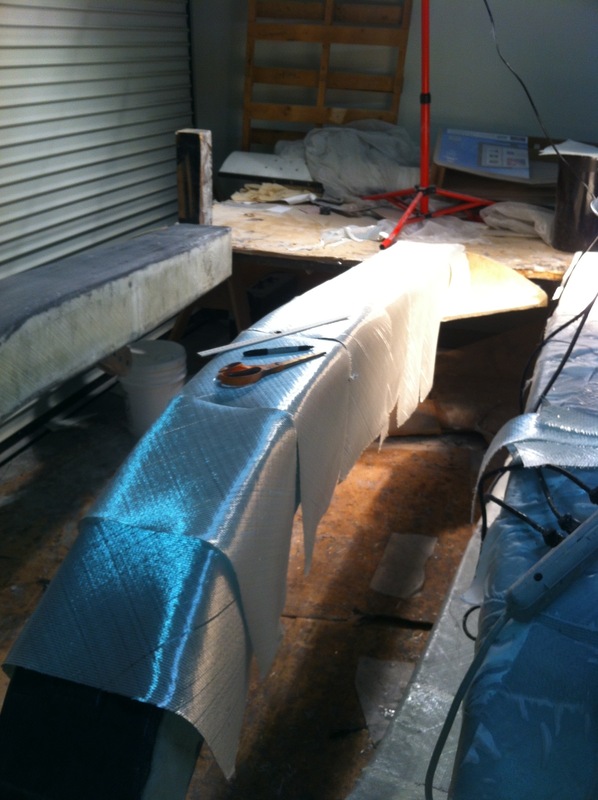 Now we start on the fairings, or ‘caps’, that mount to the front sides of the beams. When complete they’re about two feet wide, which should be a good walkway between the hulls. 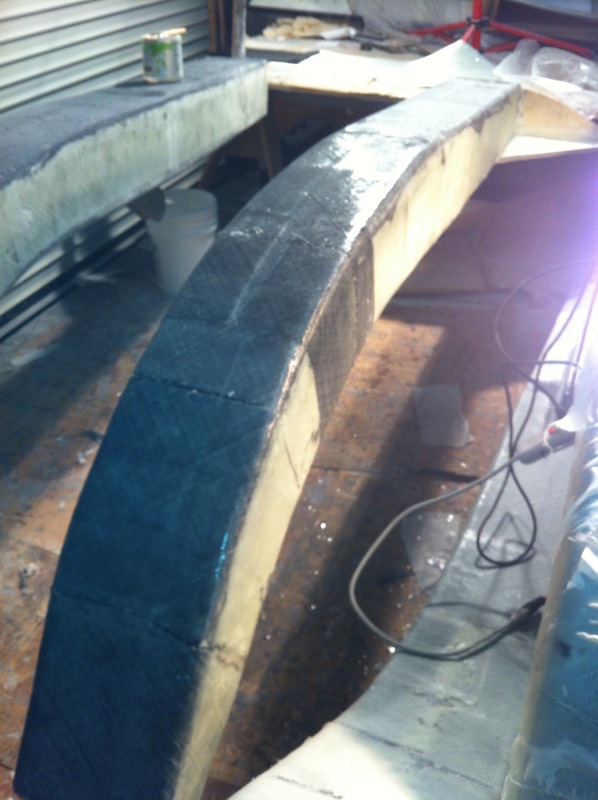 The fairings will be strip-planked in female mold frames, in the same manner as the hulls. Except these will have lightweight foam core, not cedar. Step one is transferring the plans to the frame base. The curve of the beam is seen on the left side of the white paper. 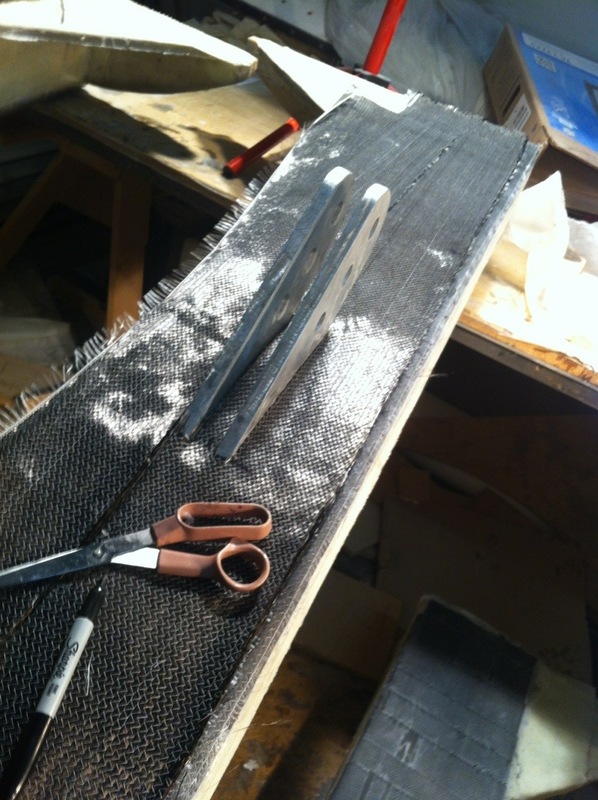 Carbon paper is laid underneath, and we simply trace over the pattern to mark the wood or foam core. 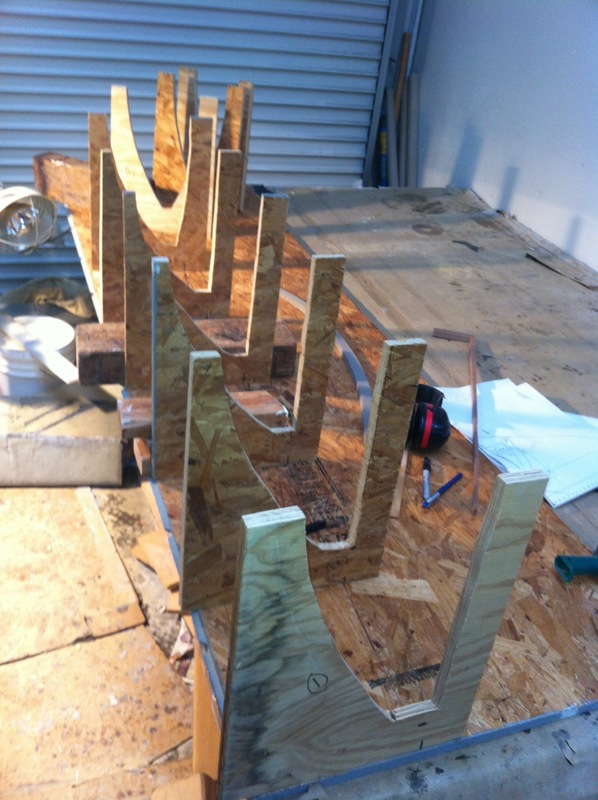 Here are the form frames getting ready for mounting to the base and then planking can begin. Glassing the beams all the way around is a messy job, with epoxy dripping and catching on the clothes, etc. So it was a night to push through, and by 12:30am all four beams are now structurally complete – building them was pretty much a full year of work squeezed in amongst the full-time “day job”. Happy to move on to cosmetics. Merry Christmas to you Royal Oakers, my colleagues, fellow FBoaters, dear family, Friends of Origami, and people humoring me by reading this stuff. May you enjoy a safe, happy holiday time. And if things go well, let’s sail this big boat together in late 2013! Just like peeling the last apple in the canning batch, we finally found the last piece of over a hundred layering sections for the beams. All of the bottom layers had to have two precise slots cut to fit around the brace tangs. 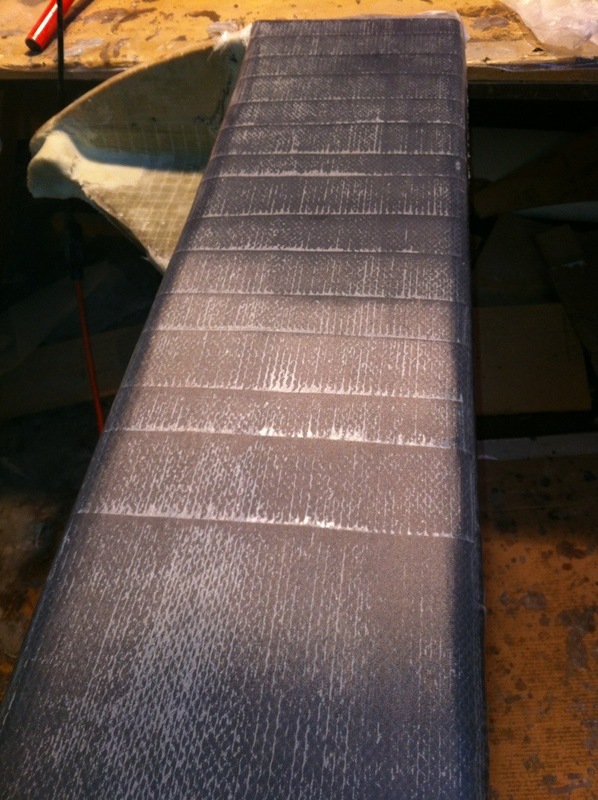 The forward beams have their final 14 layers done with progressively shorter staggers measured so that the thickest lamination is centered over the brace tang. Similarly the bottom faces got 10 more layers on the forwards and 4 on the afts. Tomorrow I’ll add the reinforcing patches at the high stress points, then the complete beams get wrapped in two layers of fiberglass. 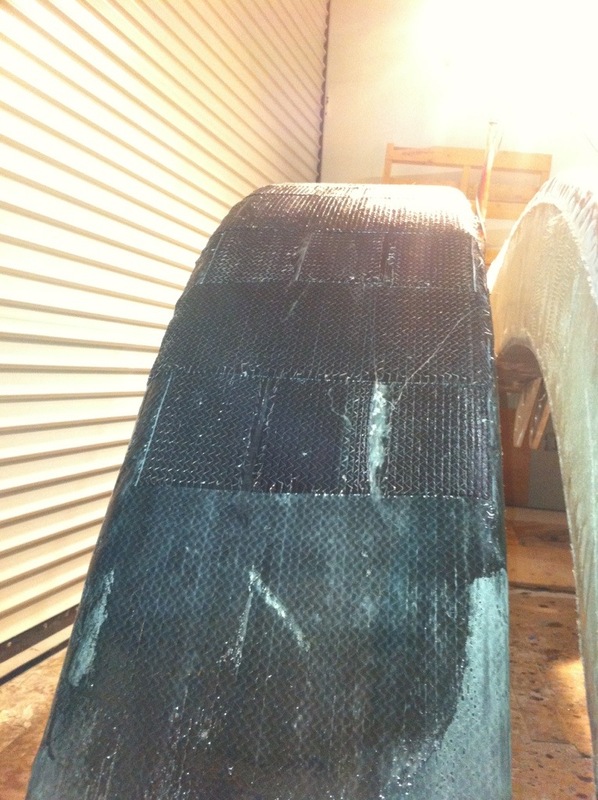 Finally getting to the outer layers of carbon fiber! These are the staggered last six layers on the aft beams. Forward beams will get 14 layers next weekend. 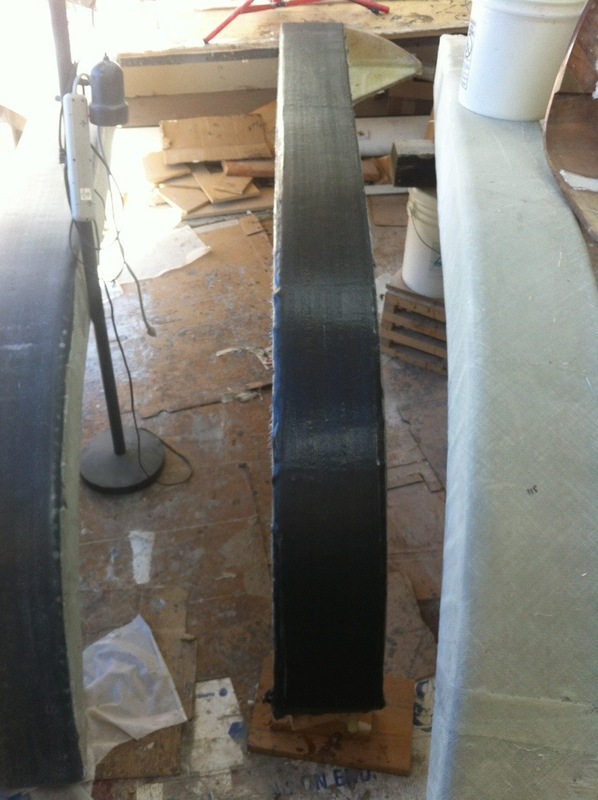 Finally, the beam work arrived at the satisfying step of laying down large tracks of carbon fiber! Listened to the 49er’s game on the radio while rolling out an entire football field’s worth of laminates this afternoon. 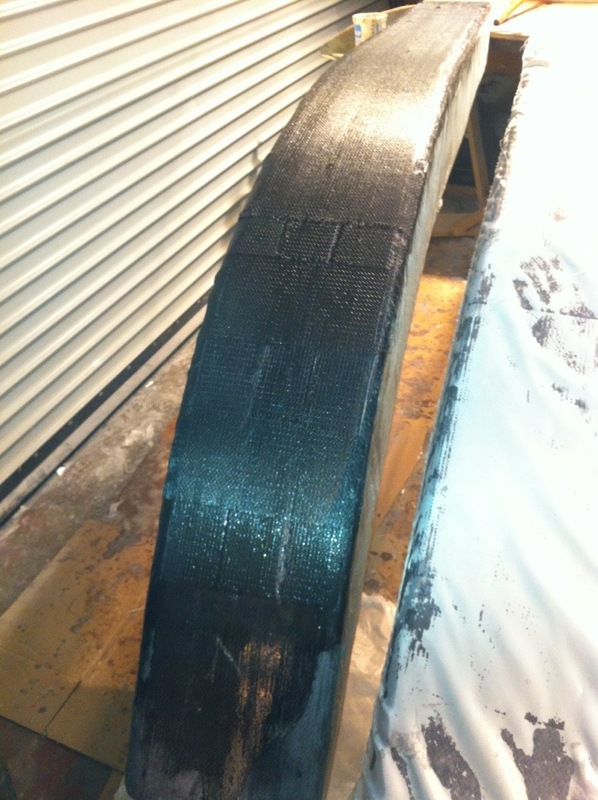 After a busy weekend, all beams now have six layers of carbon on both their top and bottom sides. That’s it for the bottoms. 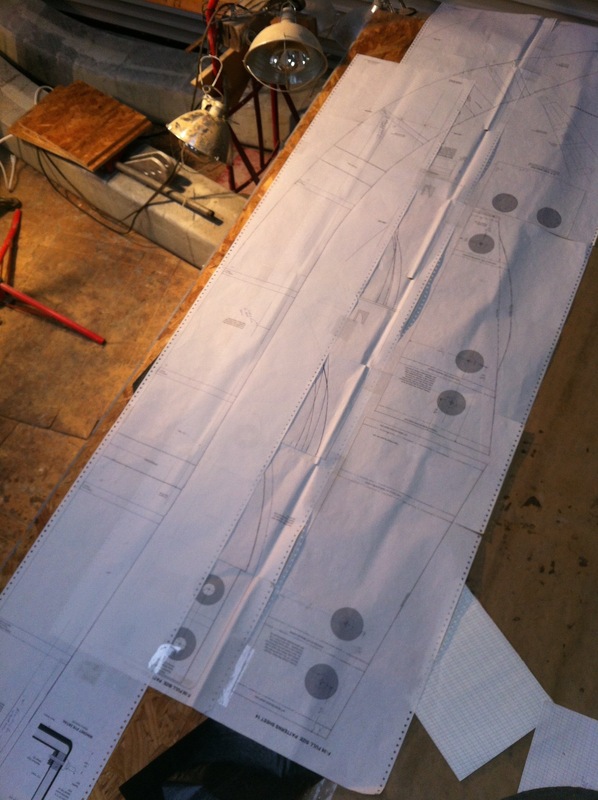 Next weekend it’s 14 more layers for each of the forward beams, and a lesser amount for the aft beams. Watching the $500 rolls of carbon whirl away is a bit like the depressing feeling at the gas pump when fueling up a Suburban. Gulp. The beams are getting quite heavy, but still possible, for single handing. The fitting into the floats will certainly take two people and some jacks. But that’s still a ways off. Trying to decide the sizing of the aft cabin – to – cockpit hatch. 24″ square is too big. A 20″ unit seems just big enough for shoulders access, but will mean cutting away more cabin roof than already done. Glad I experimented with various sizes in cardboard this weekend. Now it’s keeping an eye on the clearance page at Defender – seems to be the best place for good deals.